Despite its goth-sounding name, skullcap doesn’t make you dark or broody - in fact, it helps you stay calm, healthy, and balanced. Despiteits goth-sounding name, skullcap doesn’t make you dark or broody - in fact, ithelps you stay calm, healthy, and balanced. Skullcap (or “scullcap”) is the common name forthe different plant species in genus Scutellaria.They’re called “skullcaps” because of the helmet-like shape of the calyx - thatpart of the plant that encloses and protects its buds.The different species of skullcap plant have many uses in traditional medicine,particularly in Chinese and American medicine. Scutellariabaicalensis has long been used in Chinese medicine totreat fevers, lung problems, and liver problems. The root of the Chinese skullcapplant is also one of three herbal remedies for “clearing internal heat” andrestoring proper balance within the body. American skullcap was also well-known amongNative American tribes for its ability to aid and promote menstruation, so theyoften used it in coming-of-age ceremonies for young girls to welcome them intowomanhood.5 Itwas also used to treat diarrhea, kidney problems, and breast pain, as well as amild sedative to aid with insomnia and anxiety. In 2004, a study involving healthyand “mildly anxious” participants showed that American skullcap “significantlyenhanced” the mood of the study’s participants without affecting their cognitionor energy levels. 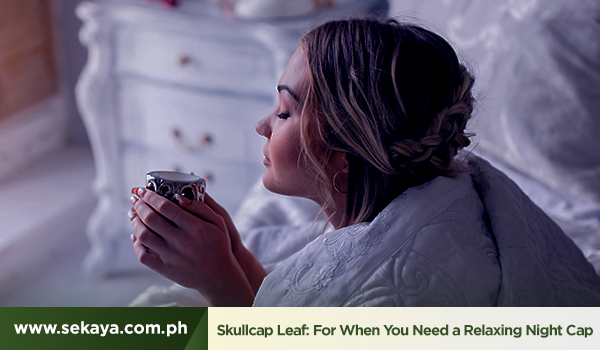 Today, skullcap leaf is still commonly used as aningredient in herbal remedies, tea, or tonics meant to treat insomnia andanxiety.That’s why we’ve also included it in the Sekaya Cozy Calm Botanic Infusion. Madewith skullcap leaf and other calming ingredients like chamomile flower, catnipleaf, and decaffeinated Indian green tea, Cozy Calm is a soothing infusion thatcan help you unwind, relax, and get a good night’s rest.